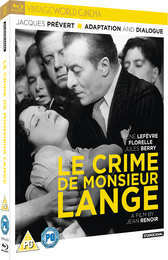 Le Crime De Monsieur Lange - El Crimen Del Sr. Lange (V.O.S.E) (DVD) - Jean Renoir. 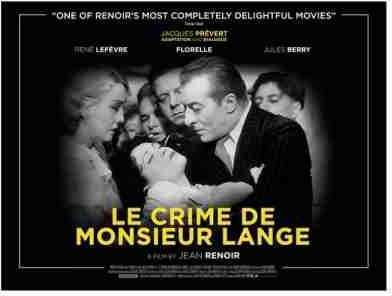 The Director’s name alone should be sufficient for many to want to get a copy of ‘Le Crime de Monsieur Lange’, one of Jean Renoir’s slightly lesser know works, made just a year prior to his undisputed political masterpiece, ‘La Grande Illusion’. Sometimes a famous director’s lesser know works can disappoint (some of Fritz Lang’s US films are surprisingly humdrum for example) but there is no such worry here. ‘Le Crime de Monsieur Lange’ is a gem; full of great humour as well providing a cohesive narrative to throw a few darts at the pumped-up wheels of capitalism. This brand new, 4K restoration of the film finally offers up an edition worth viewing, with many of the visual wear of previous editions eradicated (which is not to say it’s a perfect transfer as it isn’t). Monsieur Lange (René Lefèvre) is an administrative clerk in a dreary publishing house who writes pulp Western novels in his spare time, full of clichés and adventure, featuring a corny hero ‘Arizona Jim’. Although Lange has never been to Arizona, he’s read all about it and spends much of his spare time fantasising about life in the Wild West. His boss, Batala (played to perfection by Jules Berry), who has used the company funds to prop up his lothario lifestyle, tries to stave off financial ruin by suggesting to a commercial sponsor that Lange is a literary genius and they are about to publish his works. Lange cannot believe his luck at first but is then shocked to discover that Batala has edited his work to include ill-fitting tributes to a brand of pills. ‘Arizona Jim places his gun on the table and reaches for his pills…’ type stuff. When Lange protests, Batala is completely dismissive, hardly letting poor Lange get a word in edgeways. Batala barely pauses for breath between dodging debt collectors (and one in particular who he failed to correspond with as Lange forgot to pass on a telegram to him) and chasing the ladies. When he eventually feigns death to avoid paying his due, supposedly killed in a train crash, Lange and his co-workers take over the business themselves, as a co-operative, and with the popularity of his westerns, and with the hard-working spirit of the team, they soon turn the business into an extremely profitable one. 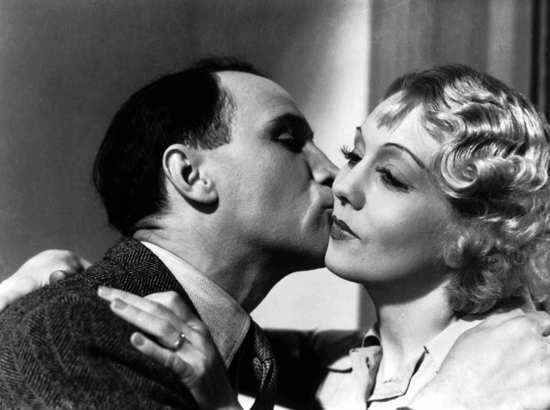 To make matters even more magical for M. Lange, he falls in love with a neighbour (Florelle) who reciprocates, and everything seems to be going his way. Well, that is until, like a bad penny, and sniffing opportunity, Batala comically rises from the dead to demand a lion’s share of the profits. The film is a barely disguised political statement about capitalism versus co-operativism though, despite that, is incredibly entertaining. 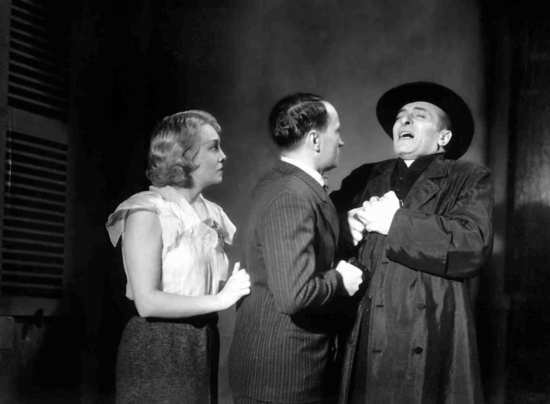 Although it precedes many of the classic Ealing comedies, it has that feel, like ‘The Man in the White Suit’ (1951) with its comical dig at the machinations of capitalism. Image quality is good throughout, the best you’ll see it, in all likelihood, with a recently restored 4K transfer. Audio is a bit thin and trebly, in common with many films from this vintage (it is 80 years old after all) but very adequate. The disc comes with one contextual feature: Lange, or the spirit of the Popular Front, which is a 30 minutes visual essay focusing on the link between the film and French politics and the rise of the Popular Front at the tail-end of the 1930s. It’s notable that the Popular Front were elected just months after the film’s release. 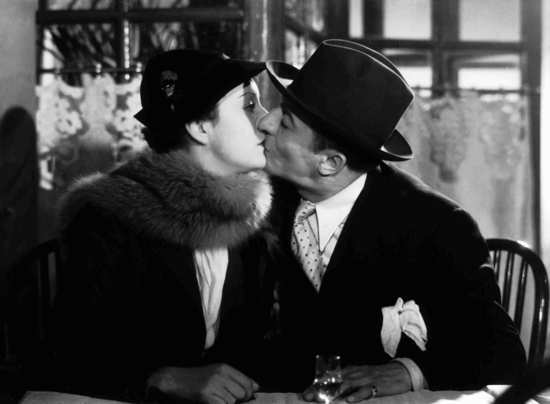 Slightly academic in tone, It features Renoir biographer Pascal Mérigeau and French cinema expert Dominique Maillet, providing a fascinating assessment of the film’s historic context and influence. The bottom line is that, putting aside the film’s historic significance, it’s a light-hearted, fun comedy thriller, somewhat in the vein of later Ealing or Boulting Brother's comedies – lots of gentle humour, but with a serious message at heart. This edition is highly recommended.